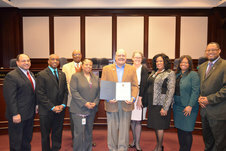 The County Council presented a Proclamation to Jim Foster of the Anacostia Watershed Society in recognition of the “Year of the Anacostia,” during the January 30th Council session. The County Council convened a briefing on Nonprofits led by Tonia Wellons, Vice President, Greater Washington Community Foundation; Heather Iliff, President, Maryland Nonprofits; Hillary Linderman, Executive Director, Nonprofit PGC; along with County Council Consultant Donna Crocker Mason. 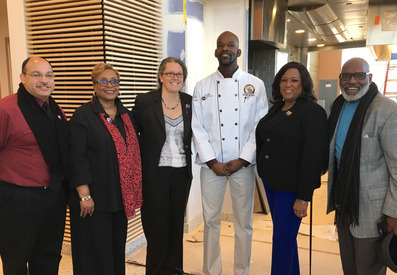 Chair Glaros, Vice Chair Turner, Council Member Harrison, and Committee Director Stone, joined President Charlene Dukes and Chef Whitfield for a preview tour of the new Prince George’s Community College Culinary Arts Center, which is fully funded by Prince George’s County. The County Council and County Executive transmitted the County’s State Legislative Priorities for the 2018 General Assembly Session to Governor Hogan, Speaker Busch and Senate President Miller. The County Council transmitted a letter to Gov. Hogan urging him to deny the certification TransCanada needs to build a new fracked gas pipeline under the Potomac River. Prince George's County led the state in banning fracking in 2016. Securing additional and innovative funding for school construction is a top priority of the County Council during the 2018 General Assembly Session. Council Member Franklin testified in favor of the core concepts of SB-92, the School Overcrowding Reduction Act of 2018, on behalf of the Council.